While this is not new we have discovered many of our clients are not aware that many companies in the “restoration” of natural stone use the process of Crystallization (aka virtification). One of them is a major franchise service. There are many carpet cleaners that have attended one day seminars that also practice this as a means of getting into the stone restoration business. We often receive calls from customers that have had their stone crystallized and are disappointed with the results. This often occurs when they see a friends floor and wonder why theirs doesn’t have the deep clarity they have, among many other troubling issues. The crystallization or re-crystallization method is the use of a chemical with a steel wool pad to create friction and heat on the surface of natural stone. This method produces an effect that could be called a “shine” to the stone. The main chemical used are fluorosilicons. These fluorosilicate compounds contain an enamel wax. The chemical also contains an acid to break down the calcium carbonate within the top layer of the stone, attaching the fluorosilicons and creating a new compound called calcium fluorosilicate. This imperious film blocks the pores of the stone which later results in spalling and cracking. While the immediate results have produced a shine, The end result also leads to a list of many problems and issues. The first issue is that the scratches that were present before restoration are still there, just shiny. As you may know, whether polished or not, these scratches and pits collect dust, dirt, and grime during the course of the day. Especially when you run your swifter mop to clean. These little grit grinders eventually sand off the surface shine. So the restoration company using crystallization needs to come again. The second issue is financial. Since re-crystallization consists of wax of sorts, it needs to be re-applied more often than the “correct” polishing procedure needs to be performed. And the “shine” never lasts. Thus leading more business to the original unorthodox company. Don’t worry… they usually have you sign an annual contract for them to service month to month. The third issue is more scratches. Yes more. Not only from the dirt, but from the company’s steel wool pads that they used to re-polish. Look closely and you will find lots of swirly scratches. The fourth issue noticed is “Why is my marble turning orange-red and getting darker?” The reason is that the steel wool pads are leaving iron behind, which of course turns into rust. Unfortunately it is embedded into your stone. The fifth, and hopefully the last issue, is that the stone will dry out and begin to crack and chip easily. This is an expensive repair, but if re-crystallization were to continue, there is no use to have any repairs done. If the re-crystallization process continues, the stone deteriorates and falls apart. Thus leading to the replacement of marble or calcite based floors. For the alternative, correct and natural process for stone restoration please feel free to call us if you live in the Dallas/Plano area. We will continue to Blog about this issue as it is far reaching and proves to be extremely costly to the consumer in the end. 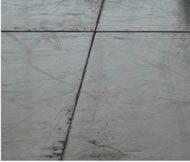 Tags: limestone polishing, marble polishing, Plano, Stone restoration, travertine polishing Dallas This entry was posted on Wednesday, April 29th, 2009 and is filed under How To Choose A Stone Restoration Company . You can follow any responses to this entry through the RSS 2.0 feed. Both comments and pings are currently closed.